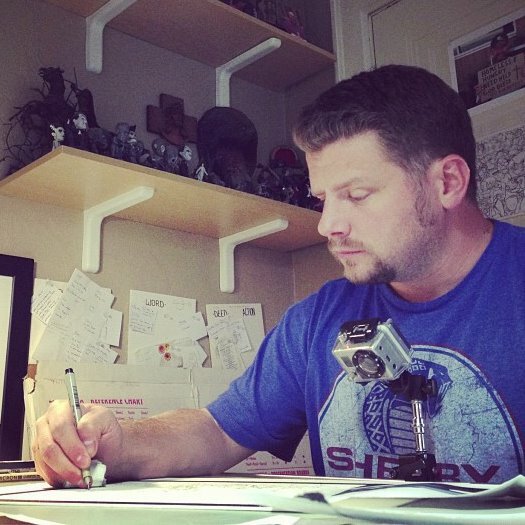 His goal is to create images that educate, interest, and sometimes inspire. His work has been recognized annually by the Society for Professional Journalism. His fantasy and horror work can be seen in Spectrum 14, 15, and the upcoming 16. His client list includes: Revolver Magazine, Moonstone Comics, White Wolf, and Wizards of the Coast. In addition Woodrow has been an adjunct professor at CCAD College Columbus of Art and Design and Art Academy of Cincinnati, for several years where he teaches Illustration; Hinton also guest lectures at other Universities and institutions on occasion. Woodrow currently resides in Cincinnati with his beloved wife Lisa and their ferocious shih tzu-poo Rockwell.